Itchy skin can be irritating for your dog, and it can be distressing for owners to see their pets in discomfort. There are different causes of this condition but if it is treated early, your dog should make a full recovery. Conventional treatments can be used but there are also several home remedies that can provide effective relief from itching. Itchy skin will be easily identifiable by your dog's actions. Every dog scratches occasionally but if your dog is itching more than it usually does or seems to be in discomfort, this could be a sign something is wrong. 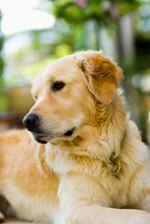 Itchy skin might also manifest in red or flaky skin, especially if your dog has been scratching it. Checking your dog's skin and coat regularly will help catch any problems early and allow you to get him treated. There are several potential causes of itchy skin, so it is important to find out what is causing the condition as soon as possible. While the itching might be because of something mild such as an allergy, dog expert Tess Thompson explains the condition of a dog's coat and skin is a good indicator of underlying health problems. If your dog is repeatedly scratching or licking a certain area, this could cause the skin to become raw and develop secondary infections. There are several different types of treatments that can be used at home to relieve itchy skin. The Daily Puppy says that moisturizing products such as vitamin E or fish oil can be soothing to skin when applied topically or brushed through the dog's coat. A short, cool bath or water mixed with Epsom salts can also relieve itching. Natural antiseptics such as tea tree oil and calendula extract can help minor infections. Conventional treatments for itchy skin can contain a lot of chemicals, which might worry some pet owners. There is much debate among owners and veterinarians alike over whether long-term use of these medicines can have a harmful effect on animals. Providing home treatments instead allows you to treat your dog's condition with natural ingredients. As The Daily Puppy remarks, treating your dog at home also allows you to avoid expensive vet fees. Although home treatments provide an effective way of relieving itchy skin, it is also important to remember that you are only treating the symptoms. Pet Alive warns owners that home treatments only help your dog in the short term and that veterinary treatment will be required in the future to uncover the cause of the problem. Even though they help your pet become more comfortable, if the area shows signs of infection, then it is important to seek professional advice.